Well let's start with the obvious first. Demetrius Shipp Jr. really does look like Tupac. He definitely shines in various moments of the film. He was able to capture Tupac's charm, wit, and exuberance. His best moments will probably be the times when he expresses Tupac's deepest thoughts and displaying Tupac's overall growth. There are a number of other actors that deserve some recognition too. Danai Gurira (played Afeni Shakur) certainly did a wonderful job of portraying Tupac's mother. While she didn't necessarily overtake the film, she most definitely made a significant impact whenever she was on screen. You could easily see how much of an influence her character made on Tupac through Gurira's performance. Both Gurira and Shipp shared pretty good on-screen chemistry that really sold the mother/son relationship. Other supporting characters contributed positively too. Kat Graham did a nice job of playing Jada Pinkett. Those haircuts really helped sell the look too. Dominic Santana also delivered a solid performance at portraying the very intimidating Suge Knight. It goes without saying that the musical component to this film is also something to look forward to. There's an assortment of Tupac's most famous songs, so that will be sure to at least entertain audiences. As far as the story itself, it there was an intentional effort to elevate the young rapper in a positive light. Remember Demetrius Shipp Jr and how he had various moments to shine? Well there were other moments where he simply didn't. I can't fault him too much only because he's never acted before this. However, I do place some blame on Director Benny Boom. No disrespect to him, but he was simply not a good fit to direct this movie. With an inexperienced actor like Shipp Jr., you need a more experienced director to help make up for the Tupac actor's weaknesses. There were just a number of scenes throughout the film that felt like the director should've said "CUT! Nope. Not gonna work. Do that again!". Another issue was the decision made with Snoop Dogg. Rather than casting another look-a-like for the minor role, or at least someone who sounded like Snoop, they opted to do a voice-over instead. It IMMEDIATELY cheapened the entire production quality of the film. It's hard to say whether it was left to be intentionally funny or not, but at that rate they would've just been better off casting the real life Snoop Dogg himself. For those who have known Tupac through the media and his music, one thing that you'll probably know is that Tupac always kept it real. That means whether it was good or bad, what you saw from him was authentic. This movie in my opinion tried too hard to be safe about the controversial figure. It just didn't come off as the raw Tupac people started to either love or hate. As a result, it was difficult to really capture the full complexity that made the iconic rapper so captivating to both his fans and his opponents. While the movie did try to touch on the various issues and beefs the rapper encountered, it really didn't dig deep into them either. I mean we don't even see Puffy at all. We never see that real Tupac spitting in the camera of the media. The story just felt way too safe. One of the biggest things I wanted this film to tackle was Tupac's death. (Spoiler Alert) I wanted to see if it would captivate me into the flood of emotions similar to the way Straight Outta Compton did for Easy E. In my opinion, this film slightly missed the mark. Maybe it was the gospel song selection that played in the background, or something else. Either way, Tupac's death scene just didn't hit as deep as I would've hoped. Okay, I know what you're going to ask. "Was this better than Notorious?" "Was it as good as Straight Out of Compton?" "Should this have been a Lifetime movie instead?" Well, to me, the Notorious movie was forgettable minus the fact that we acknowledged that Jamal Woolard did a nice job playing Biggie. All Eyez On Me was not "trash" or on the level of a Lifetime or BET movie. However, let's take a moment and be real for a second. A "Tupac movie" SHOULD be equal or better than Straight Outta Compton...and this doesn't come close to that. The biggest threat to this movie is the expectations that will come along with the musical icon that is Tupac. In other words, if you're going to do a Tupac movie, that movie better live up to be just as great as Tupac himself. Unfortunately, with such expectations, almost any attempt would set this movie up for some level of disappointment. It's difficult to say whether or not this movie should be seen in theaters or not. On one hand, if you're a Tupac fan, you've been waiting for this for decades. On the other hand you've got the issue of simply supporting movies that portray and are created in accordance to your social group's perspective. Because without any support, the film industry simply relies on the idea that there's no need to make these types of movies. So when it comes to my recommendation, I will only resort to saying that this movie is watchable. (Take that however you wish.) I'm not going to tell you to pay full price, see it as a matinee, or even for free at home. It's watchable in the sense that while it has some highs, it definitely also has some lows too. I don't think that it lives up to the hype it should have, but the reality is that some people are still going to be entertained by this movie. I fully admit that I didn't grow up listening to Tupac, so you could say I'm just a casual fan of his work. I will say however, that if you were unfamiliar with him, one thing that this movie may do is inspire you to go out and learn more about him. Listen to his interviews, and the lyrics of his music. 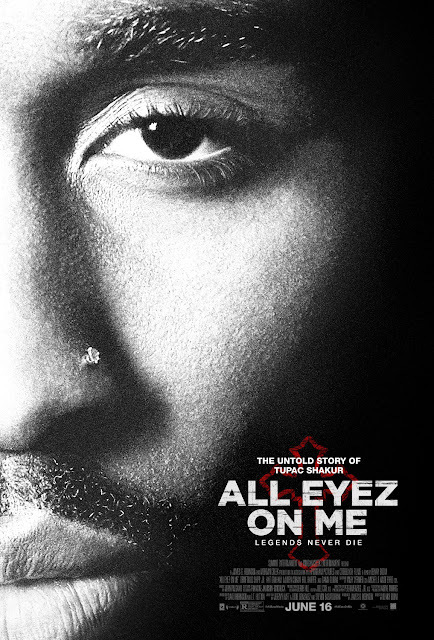 While All Eyez On Me may not have lived up to his elite status, the film certainly doesn't take anything away from Tupac's legacy either.